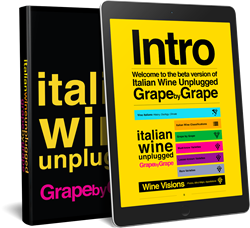 Italian Wine Unplugged analyzes over 430 Italian native grape varieties in accessible and easy-to-remember entries. A new ebook that unpacks the biodiversity of Italian wine and its grapes has just been released online on Amazon in its beta version. Italian Wine Unplugged: Grape by Grape offers a concise yet comprehensive cultural and scientific introduction to Italian wine and its hundreds of native grapes in a visually compelling layout. Compiled by a team of Italian wine experts and educators, the ebook analyzes over 430 Italian native grape varieties in accessible and easy-to-remember entries. Designed to offer the contemporary wine lover a new reading experience, it includes an extensive visual apparatus featuring grape variety flash-cards, mind maps, photographs of grape bunches, and maps of Italian wine appellations. The ebook provides introductory chapters that offer essential historical, cultural, geographical and scientific information necessary to understand the richness and complexity of Italian grapes and their wines. It is also a schematic reference tool that will help readers and students of Italian wine find order in the seemingly chaotic world of Italian grape varieties. The mastermind behind Italian Wine Unplugged is Stevie Kim, Managing Director of Vinitaly International. Kim has engaged a team of experienced authors and Italian wine educators coordinated by Ian D’Agata, Scientific Director of the Vinitaly International Academy and author of the award-winning treatise Native Wine Grapes of Italy (Univ. of California Press, 2014 and winner of the 2015 Louis Roederer International Wine Writers’ Award as Book of the Year). Kim and D’Agata’s dream team includes Geralyn Brostrom, co-founder and education director at Italian Wine Central in Napa, California; Lingzi He, wine educator and journalist based in France and Hong Kong; Michaela Morris, wine writer, educator, and presenter based in Vancouver, Canada. Brostrom, He, and Morris have distinguished themselves within the Vinitaly International Academy exam, earning VIA’s highest certification title, “Italian Wine Expert,” attesting to their profound knowledge of Italian wine and its grape varieties. Some of the ebook’s sections have also been curated by Michele Longo, Italian wine writer, sommelier, and experienced judge for wine competitions. JC Viens, Deputy Editor of Spirito di Vino Asia and WSET Educator, contributed the mind maps in the final section. The Italian Wine Podcast host and wine writer Monty Waldin wrote the preface to the ebook. All contributors met and worked together thanks to the educational work of the Vinitaly International Academy, the international institution and community committed to explaining, divulging, and broadcasting the science and culture of Italian wine around the world. The ebook is aimed at wine lovers and professionals all over the world who would like to begin discovering Italian wine and Italian grape varieties. The ebook will also be used as a course book for the entry-level Italian Wine Maestro course, a new course soon-to-be organized by the Vinitaly International Academy. Written for both wine lovers and wine professionals, Italian Wine Unplugged: Grape by Grape is a concise yet comprehensive cultural and scientific introduction to Italian wine and its hundreds of native grape varieties. The ebook analyzes over 430 native Italian grape varieties in accessible and easy-to-read entries. It also features color-coded grape variety flash cards and an extensive visual apparatus with mind maps, photographs of grape bunches, and maps of Italian wine appellations. Available on Amazon in beta version.